The Alabama Birding Trails highlight the best public locations for watching birds year-round. 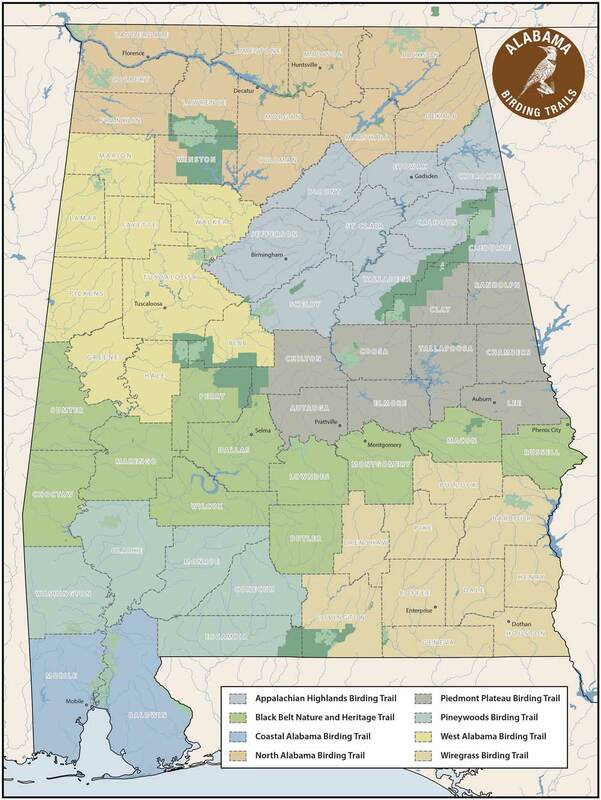 Alabama’s Birding Trails has 270 sites covering our great state from the mountains to the gulf. Get out and explore! With over 430 bird species documented in Alabama, there’s more to see here than you can imagine. Watching a Bald Eagle feeding babies in the nest near Guntersville State Park? Check! Sitting quietly as dozens of Rose-breasted Grosbeaks literally crash-land into the nearest tree on Dauphin Island. Absolutely! These are just two of the stops along this series of 8 trails and 270 stops. Over 10 years in the making, the system of eight trails highlights the best public locations available to watch birds year-round. Alabama provides critical habitat for hundreds of bird species, from the Endangered Red-cockaded Woodpecker to the now flourishing Bald Eagle. Interest in wildlife observation continues to grow, and more and more people want to explore our amazing biodiversity, which makes us second only to Florida in the Eastern U.S. in total number of species of plants and animals. The Birding Trails project provides a major attraction for nature-loving tourists, while offering exciting birding opportunities for Alabama’s school groups, families, and seasoned birders. The eight Alabama Birding Trails unify existing and potential birding sites into a series of cohesive trails and loops that are collectively marketed as part of a state-wide system. Many of the sites along the various trails are already being used by thousands of birders and other visitors annually. Alabama’s Birding Trails offers the public a chain of eight geographic regions known as the following: North Alabama, West Alabama, Appalachian Highlands, Piedmont Plateau, Black Belt Nature and Heritage, Pineywoods, Wiregrass, and Alabama Coastal Birding Trail. Alabama Birding Trail logos and mascots.